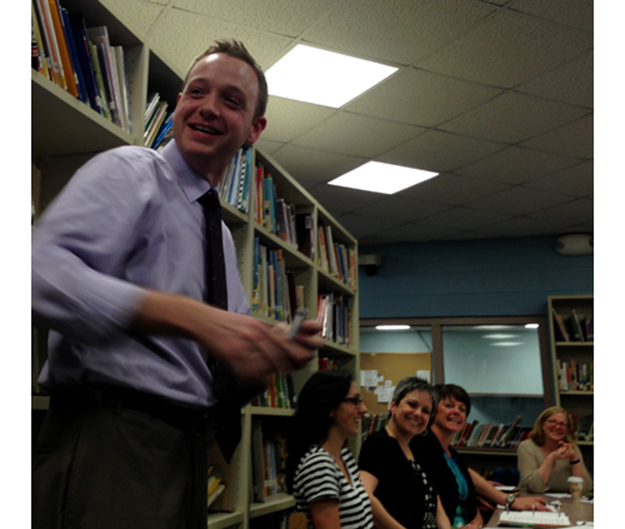 JULIE LANE PHOTO | Social studies teacher Brian Doelger received tenure at Monday night’s Board of Education meeting. The final phase of the proposed $2.8 million school renovation project kicks off June 24, with installation of new windows and replacement of a water tank. If the project remains on course — and Superintendent Michael Hynes cautions about counting money saved until all bills are in — the district could see the project completed for about $2.7 million. Brian McClave of McClave Construction told the Board of Education Monday night there’s been a $10,000 overrun incurred to meet Suffolk County Department of Health Services requirements pertaining to the placement of the new water tank. That’s because there were tests that had to be done to demonstrate its safety and its appropriate distance from sewer lines that come into the school. During the water tank installation, the roadway in front of the school will be closed for about a week. It was a night of celebration Monday as colleagues and friends crowded the meeting room to honor social studies teacher Brian Doelger who was granted tenure. Among the residents was Father Peter DeSanctis of Our Lady of the Isle wishing Mr. Doelger well. Dr. Hynes commended Mr. Doelger for his rapport with students and said he would play a large role in helping develop the new “humanities house” program for students grades six through 12. Board member Mark Kanarvogel called it “astonishing” to watch Mr. Doelger interact with students. “It is a big trust thing,” Mr. Doelger told the board about his receiving tenure. “I would never let you guys down,” he promised. Valedictorian Katy Binder, who has been the student liaison to the Board of Education, told members her brother Charlie would be replacing her in that role next year. She’s bound for Villanova in September where she will study physics. Board members and teachers offered praise for her contribution to the school through the years with social studies teacher Peter Miedema telling her how much she will be missed and board president Stephen Gessner thanking her for her for representing the students at monthly meetings. The board accepted an $1,800 contribution from the Shelter Island 10k Community Fund to be used to purchase Athletic Hall of Fame plaques, certificates and frames. The initial group of inductees will be honored tonight, Thursday, June 13 at ceremonies in the school auditorium beginning at 7 p.m.